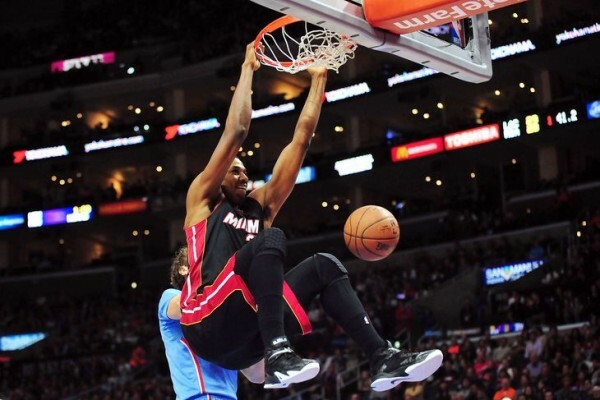 The Miami Heat belong to Chris Bosh and Dwyane Wade, but a little help goes a long way, coming from the very surprising Hassan Whiteside, helping his team beat the Los Angeles Clippers 104-90 on the road. The Clippers continue to disappoint right after every time they make it seem like they’re getting it together. Bad coaches usually let their teams be this inconsistent, but everyone has been telling Doc Rivers for years how good he is. Could have they be lying to him, as he seems more busy keeping his son with an NBA job than actually fixing the real issues with this team, which have to do with defending (yet again) when things aren’t as straightforward as they’d hope it’ll be. Chris Bosh led the team with 34 points, assisted by Dwyane Wade with 17. Whiteside? He scored 23 points to go with 16 rebounds and 2 blocks, giving the Heat the 7-footer they were missing so badly last season and wasted their time on Greg Oden, trying to rehabilitate what turned out to be a lost cause. Luol Deng can’t be trusted, and he’s the best of the supporting cast, so there’s a vacuum Whiteside is stepping into, with the Heat hoping he’s going to last for more than just a moment. So who is Hassan Whiteside? A player that didn’t make it in the NBA during his first stint with the Sacramento Kings, but got an opportunity from the Miami Heat this summer to try out and make the team. The Clippers were among those that rejected him, not giving him the opportunity to prove his worth. This season he’s averaging 6.6 points and 5.8 rebounds per game in 14.4 minutes a night, but has four consecutive games scoring in double figures. So out of nowhere, the Miami Heat might have finally found the big man they’ve been missing for so long, although they’ve lost games with him as well. A lot of players have had singular outbursts with similar numbers only to fade back into anonymity and obscurity. Whiteside’s big achievement won’t be reliving the moments from his first big game on an NBA team, but making this thing something consistent.